In May, Quiz And Survey Master had one minor update and two patch updates which closed 11 different features/bug issues! Let’s take a look at some changes. Usual 'we are not lawyers' disclaimer... Anything we describe about GDPR should not be considered as legal advise. While we strive to ensure you have the features you need to be compliant, it is your responsibility to work with a legal adviser to make sure you are compliant. Using our software and recommended features may not automatically make you compliant. With the major deadline of being GDPR compliant in May, many users asked for specific features they needed in order to be compliant according to their legal adviser. We were happy to say that we had all of the features completed and released before the deadline! For those who do not need to store any data collected at all, the quickest way to ensure you are handling user’s privacy correctly is to not store the results. In version 5.3.0, we added the option in the image above labelled “Store the responses in the database?”. You can find this option on the “Options” tab when editing your quiz or survey. 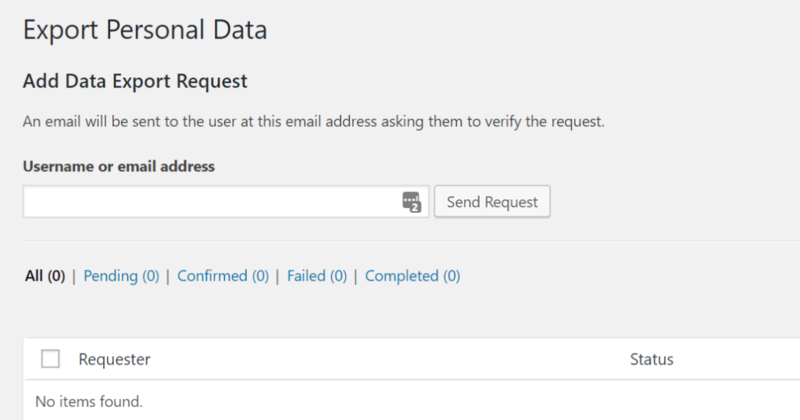 Setting this to “No” will have the plugin no longer save any of the data entered in the quiz or survey. Not all quizzes and surveys need to collect and store the user’s IP address. Up until 5.3.0, the plugin collected the IP address of every user. 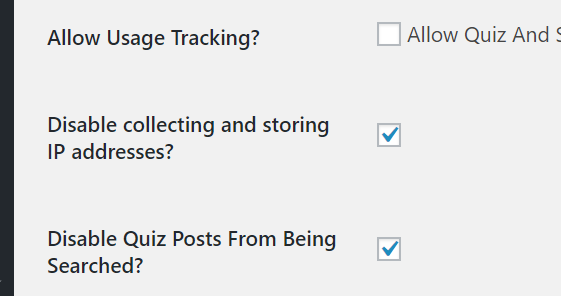 Now, you can disable this by selecting the option “Disable collecting and storing IP addresses?” found on the “Settings” page in the “Quizzes/Surveys” menu. In WordPress 4.9.6, WordPress added two new pages, Export Personal Data and Erase Personal Data, to assist with GDPR compliance. Any plugins can integrate with these tools to assist in the process of exporting or erasing user data. In version 5.3.1, QSM added our integration to these new tools. So, any data collected using QSM will be added to the exports or erasing when using these tools. Many users needed a way to have a checkbox asking for consent to store or use the data. Our “Contact” tab now has a checkbox field that gets stored with the results. The results will show whether the user checked the box or not as shown in the image above. Many users have asked for a way to designate how far through a quiz or survey a visitor is. Our new progress bar option allows you to display a progress bar that increases towards 100% as the visitor completes the quiz or survey. 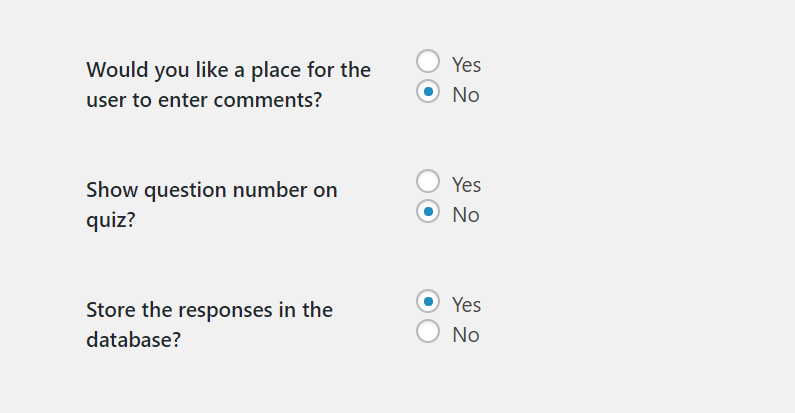 You can enable this option from the “Options” tab when editing your quiz or survey. One of our oldest addons, Advertisement Be Gone, was still using some old branding from the original days of this plugin. This plugin was originally “Quiz Master Next” by “My Local Webstop”. Once the addon was installed, many users had trouble finding the plugin as the naming did not match any of the other addons.